Most Super Bowl advertisers are keeping their Super Bowl 50 commercial still under wraps. About a dozen teasers for Super Bowl 50 Ads have been released so far. 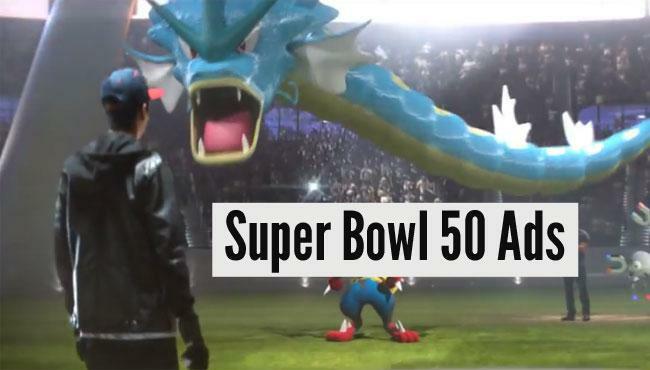 You can find the best Super Bowl 50 Ad Teasers in our Super Bow 50 Teaser gallery. Our Super Bowl 50 Ad chart lists almost 40 brands. Some brands are running more than one commercial. This means that most companies that bought a Super Bowl 50 ad have come forward. The notable recent additions to the Super Bowl 50 ad chart are Amazon, Bai and Marmot. The big hold outs are Chrysler and Hollywood. There has not been a single announcement about a Super Bowl 50 Movie Trailer. An exception is Kung Fu Panda 3, but DreamWorks went a unique way promoting the new movie by partnering with another Super Bowl advertiser named Wix.com. The first five Super Bow 50 Ads that are released in full online include the ads for Acura, Mini, Shock Top, Rocket Mortgage, Pokemon, Colgate and SoFi. 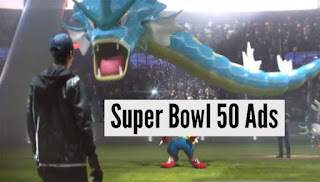 The most viral so far is the Pokemon Super Bowl 50 ad with over 7 million views on Youtube. Watch all released Super Bowl 50 Ads below.